If you're looking for anxiety treatment in the Chicago area, and want to try the cognitive behavioral (CBT) methods you see here on my site, I'd be happy to work with you in my Chicago Loop office. Most anxiety disorders are quite treatable. When people get appropriate help, they generally get better. If you're like most of the patients I work with, you can probably make a good recovery from these problems. I do most of my work in individual sessions. However, I also offer a group program for fear of flying several times a year. My approach to anxiety treatment is based on cognitive behavioral methods, and it's pretty concrete and practical. It's very different from traditional psychotherapy. Traditional psychotherapy will review your early life experiences and try to answer the "why" question - "why do I have this problem?". If you work with me, we'll be much more focused on the what and how questions - "what happens to me when I become anxious?" and "how can I handle this differently, in ways that enable me to calm down?". When we meet for a first session, I'll ask a lot of questions, mostly aimed at helping me get a good picture of how you experience anxiety: what symptoms you experience, where you experience them, how they affect your life, how you respond to them, what you've tried in the past, and similar questions. I'll want to know a little about your work, family, and daily routine, maybe a little about your background, but mostly I'm going to focus on the anxiety problems that brought you in. I want to get a good enough understanding of your present experience with anxiety to be able to start suggesting responses, techniques, and experiments you can try within the first or second week of anxiety treatment. Thereafter, we'll use our time together to review the results you get from these techniques, fine tune them as necessary, and plan more "homework" for you to do in between sessions. As you do better, and start achieving the goals you brought into therapy, we'll start meeting less often, in preparation for finishing our work together. It depends on the problems you bring in, how long you've had them, how deeply embedded they are in your daily life, and other factors. But in general, this is not a long term kind of treatment. I see the majority of my patients for somewhere between 5 and 20 visits. This isn't the kind of treatment in which you come in for a significant time and still don't know if it's helping or not. While I can't say in advance how long your situation may require, I do expect, within a couple of sessions, that you get a good gut sense that this is taking you in the right direction. If that doesn't happen, something's not working right, and you should bring it to my attention. If you want to schedule a first appointment, or have questions about working with me, please call me at 312.912.9989. If you prefer, you can use the form below. Just keep in mind that e-mail is not a confidential medium, so don't use it to send me personal details you want to keep private. Please excuse the necessity for the password protection on the e-mail form. It helps keep spam out of my mailbox. Once you've contacted me this way, you'll be able to e-mail me directly thereafter without use of a password. (# 071-003556) and New York (# 015044). I received my Ph.D. in Clinical Psychology from DePaul University in 1985. I'm a member of the American Psychological Association; the Anxiety Disorders Association of America; the Association for Behavioral & Cognitive Therapies; the Illinois Psychological Association; the Obsessive Compulsive Foundation; and the Trichotillomania Learning Center. I've been working exclusively with patients experiencing anxiety disorders since 1990, and have presented workshops for consumers and professionals all over the United States. 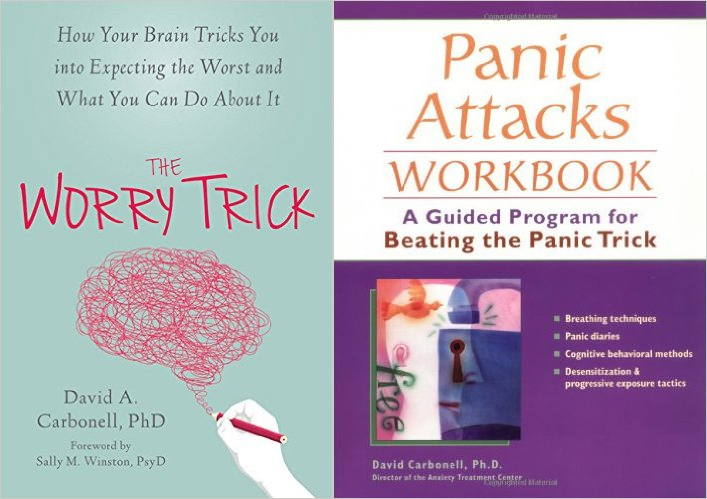 I'm the author of Panic Attacks Workbook and The Worry Trick. My fee for an individual session, 50 minutes long, is $200. I don't belong to any insurance panels. If you make an appointment, I'll ask you to pay me directly. If you have an insurance policy with an "out of network" benefit, you can take the receipt I give you and submit it to your insurance company for partial reimbursement. If your insurance policy is a PPO, you probably have an "out of network" benefit; if it's an HMO, you probably don't. If you want to find out how much your insurance will reimburse you, contact your insurance company to ask. Tell them you want to see a psychologist who is out of network; with a fee of $200; and a procedure code of 90834. That should be all the information they need to calculate your reimbursement. Everything on this web site has been written personally by me, except as otherwise noted. I do not accept advertisements on this site. Any information collected by this website, such as email addresses, will never be passed on to any third party, unless required by law. The site is wholly funded by Dr. Carbonell and the Anxiety Treatment Center, Ltd. We subscribe to the HONcode principles of the Health on the Net Foundation.